That I didn't start majorly as an Actor doesn't mean I am not good or talented. At that period back then, expressing your ambition may be costly. To me, there is NO BORN ACTOR. As a matter of fact, everybody act but not all are conventional actors. You must understand the nitty gritty to really function well. What most mistakes as talents in an actor are mere latents (features). A conventional actor is expected to have good diction, fine look, good physique, retaining memory, discipline, diverse and creative ability with high confidence level. You may have all these and lack concentration. If you are lazy and cannot invest simple concentration, no matter the other qualities, you are a no no for acting. Above all, when you have the right latents, you need PASSION and RIGHT CONNECT. The key components are: DISCIPLINE, PASSION & RIGHT CONNECT. Others are eccetra. That I started majorly as a film producer is not a testament that I have no sight in acting or others. I simply developed and invested my passion and confidence level on producing to enable me build a strong platform to exhibit other areas I have sight and latent for in future. Some acting latents are obvious and some are hidden. The right connect you are exposed to determines your confidence level. I am happy am taking it one after the other and acting for others is complementary. No matter who I use in my movie, fans have a connect with my stories, screen play and production seperately, which means they debate my talent since over 12yrs home and abroad, using good and established actors are positive complementary efforts. I have a platform to now exhibit my acting talent or any other and invariably bring along whoever I can. That is my film making BLUEPRINT, I don't know yours. Yomi Fabiyi. 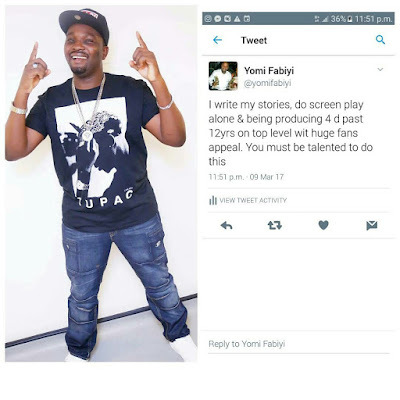 0 Comment to ""I write my stories, do screen play alone and being producing for the past 12 years– Actor Yomi Fabiyi"